My introduction to marquetry came from a book by William A. Lincoln, The Art and Practice of Marquetry. I learned the basic technique of cutting pictures by following the instructions. 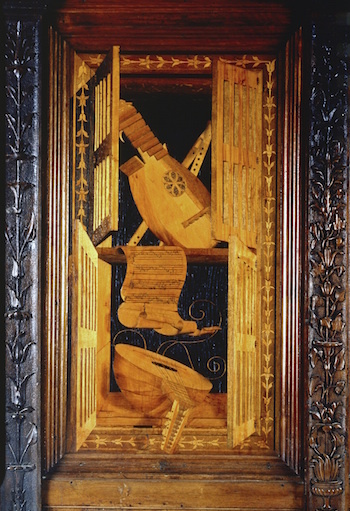 There were a handful of black and white photos of historic pieces in the book and the one that truly amazed me was this trompe l’oeil image of an open cupboard with musical instruments. It was made around 1500 by an Italian monk named Fra Giovanni da Verona. Giovanni made many panels like this that were placed in choirstalls in important churches in northern and central Italy. A dozen or more of these panels would sit side by side. The open cupboards would be alternated with scenes meant to look like open windows with landscapes or streets and buildings. Note how the four doors collect the light differently. This is achieved solely by using different species or cuts of wood. I particularly like how he made the neck and peghead of the lower lute look as if it is sticking out of the cupboard. The broken strings on this instrument are a particularly inspired touch.